Yacht designer Juan Carlos Espinosa has teamed up with H.A.R.D. 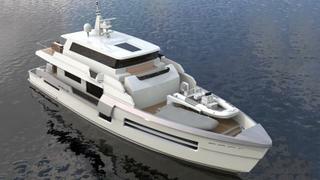 Yachts for a new 29.54 metre explorer yacht concept called the H.A.R.D. 97. A truly international project, this Kevlar-reinforced GRP design would be built in China at Heysea Yachts on a hull developed by Florida-based naval architect Nick Boksa and marketed in the US by brokerage firm Atlantic Yacht & Ship. H.A.R.D. Yachts (which stands for historic armour-reinforced design) explains that this compact explorer yacht has been designed to withstand extreme arctic conditions and even running aground. Vital statistics include a beam of 7.77 metres and a maximum draught of just 1.89 metres. Accommodation is for up to ten guests split across five staterooms, including an upper-deck owner’s suite and four further cabins on the lower deck, including a full-beam amidships double cabin. Back aft, the crew quarters allows for a staff of up to four people. The main deck is geared around socialising with a large dining area with seating for all ten guests and an adjacent bar and saloon. Tender storage is provided on the foredeck, leaving the transom area free as a waterside cockpit with great sportfishing potential. Power would come from a pair of 1,000hp Caterpillar C18 engines for a cruising speed of 12 knots with Seakeeper gyroscopes ensuring a smooth ride for all the guests. When trimmed back to its economic speed of ten knots, the HARD 97 would be capable of cruising for up to 3,000 nautical miles before the 22,700 litre fuel tanks need refilling.